Abelia x grandiflora is a evergreen to semi-evergreen mounding shrub that can get up to 8 feet tall and 5 feet wide at maturity. This Abelia is a cross between A. chinensis and A. uniflora. 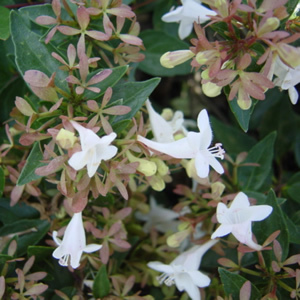 Glossy Abelia has ovate glossy leaves with clusters of pink-tinged white flowers in early summer to fall.